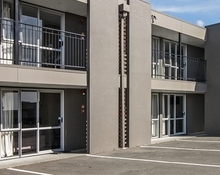 The Aspree Motor Inn in Palmerston North is a spacious complex with lots of outdoor tables and a BBQ for your use. Our units have several different configurations of beds, offering something to suit everyone without costing an arm and a leg. We welcome all enquiries large or small and can do a written quote for you if required. Just give us a call or email and we will do the rest for you.